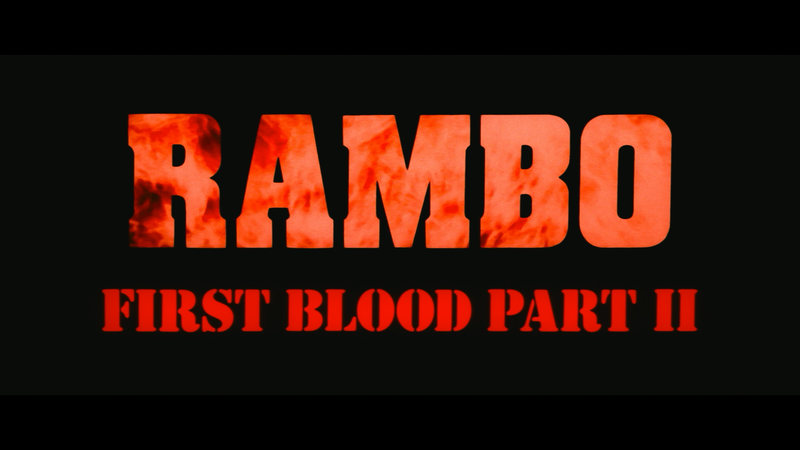 Although Rambo: First Blood Part II didn’t have as much of an emotional core compared with the first movie and is certainly far more fantastical as well, yet it does have all the hallmarks of an entertaining over-the-top violence-laden action-fest. Note: The screen captures are from the Blu-ray disc. Plot Synopsis: John Rambo (SYLVESTER STALLONE) is doing hard time in jail when his former boss, Col. Troutman (RICHARD CRENNA), offers him a deal. 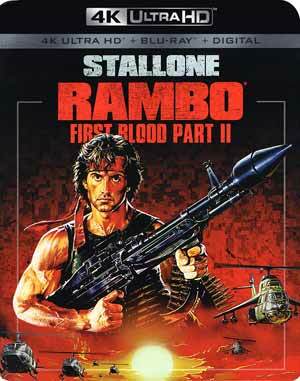 If Rambo travels to Vietnam to try to find the American prisoners of war, his criminal record will be expunged. Rambo takes the reconnaissance assignment and agrees not to get involved in any of the action. 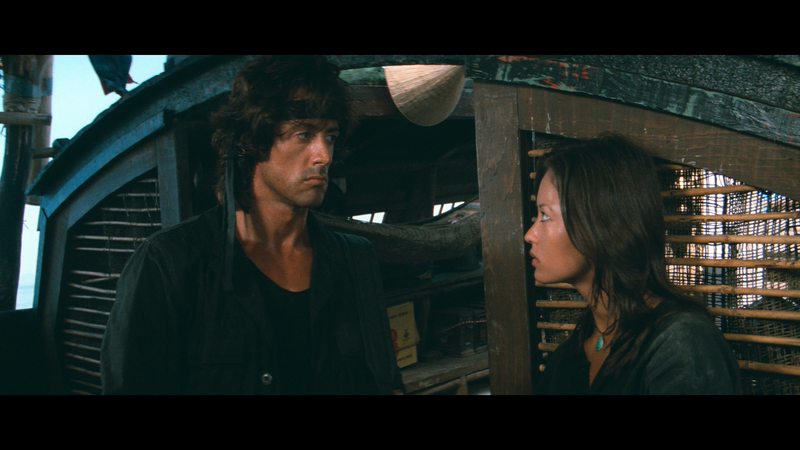 However, when his Vietnamese lover, Co Bao (JULIA NICKSON), is killed by American forces, Rambo forgets his promise and takes matters into his own hands. Quick Hit Review: Solid entry into the series, doesn’t quite have the emotional bite as First Blood, the action sequences were taken up a notch in keeping with the uber violence of the 1980s and while it is fantastical, it was a lot of fun. Stallone might not have gut-punching speech as he did at the end of the first film, and the speech in the finale here did feel forced, the man does solidify himself as an action superstar alongside is counterparts of the era, Schwarzenegger and Van Damme. 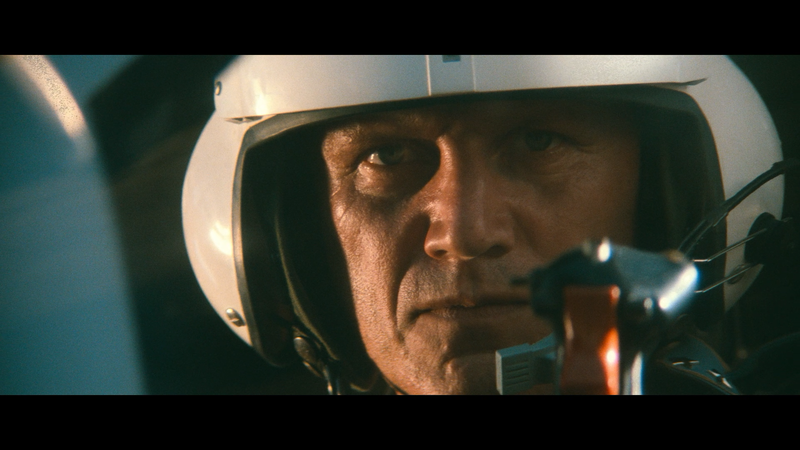 Funny enough, throughout some of the film, all I could think of is the spoof flick, Hot Shots Part Deux. 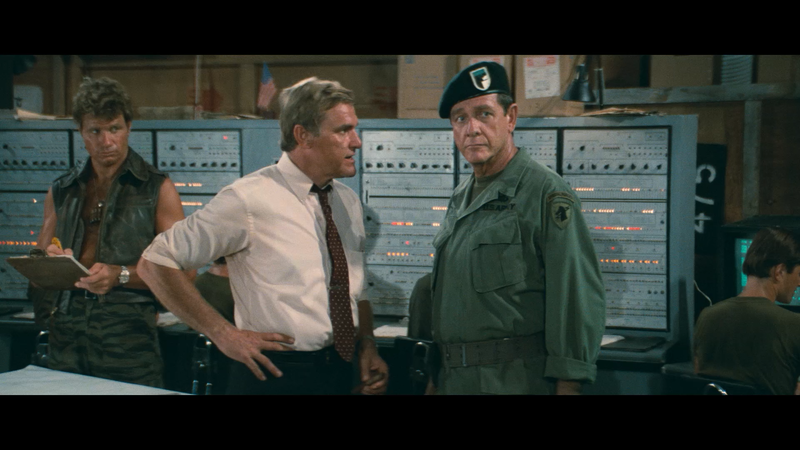 Alongside Stallone, returning to the fold is Richard Crenna who at least didn’t chew the scenery quite as much though still over enunciates his lines to a near comical level. Charles Napier plays the American foil with grating success and the beautiful Julia Nickson had a few nice scenes with Stallone, shame she didn’t have a larger role, though her character’s death was, in terms of the timing, was a bit surprising. Rambo: First Blood Part II this time was directed by George P. Cosmatos, who previously helmed the Peter Weller horror film, Of Unknown Origin (available on Blu-ray from Warner Archive) followed by the 1986 Stallone action-er Cobra and the well revered Western Tombstone before his final film in 1997, entitled Shadow Conspiracy, a movie I actually do remember seeing (and it’s no wonder it never got a DVD release in the States). In any case, the action sequences were wonderfully well done in a time when plenty of it was practically done, or at the very least with convincing miniatures versus the shoddy visual effects that, for some reason, have a tough time realistically duplicate real aerial vehicles. This release comes with a super glossy slip cover and on the back, a slit reviewing the features on the interior back cover, exactly like the ones for The Expendables releases. Inside is a redemption code for the Digital HD copy. Rambo Takes the 80s Part 2 (11:37) has the same participants from part one discussing the changes Rambo as a character underwent for this sequel and its outlandishness of story. Includes some behind-the-scenes footage from the mid 80s. We Get to Win This Time (20:03) is an archive featurette with interviews by Cosmatos, Stallone, Crenna, Napier and others filmed back in 2002. Action in the Jungle (7:40) – This promotional featurette is from 1985 with on-set comments by the cast including Stallone, Crenna, etc. The Last American POW (2:15) is a short featurette/news reel with the “last POW” from the late 70s followed by promoting this sequel. Sean Baker: Fulfilling a Dream (2:16) – We are introduced to a young man who battled cancer whom Stallone invited on set in Mexico. Interviews with Sylvester Stallone (2:11) and Richard Crenna (1:33) on-location back in 84/85. Behind the Scenes (2:17) more footage from back in the mid-80s. The Restauration (1:02) is a comparison on how the film was cleaned up with the removal of scratches and such. Obviously this was not for the 4K transfer. How to Become Rambo Part 2 (14:32) is on the training regiment hosted by Stallone’s body building coach. Last up is the Original Trailer (2:46) and Original TV Spots (2:44). 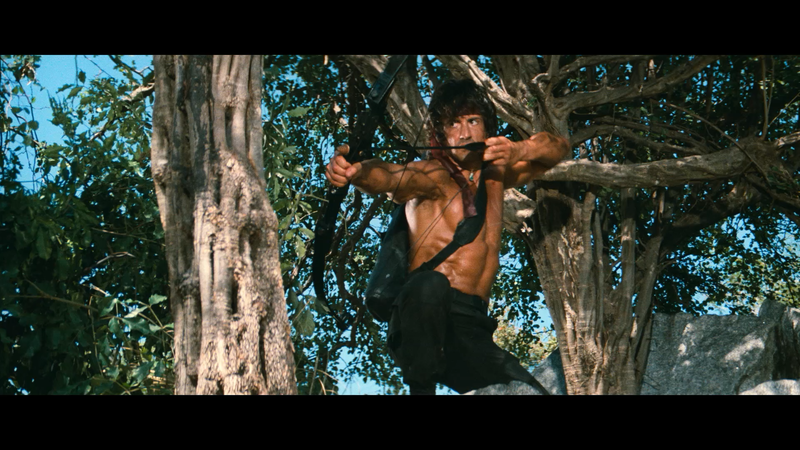 Rambo: First Blood Part II is shown with a 2.35 widescreen aspect ratio and given a 2160p high-definition transfer. As with First Blood, this 4K transfer does mostly look great, detail is sharp all through and the natural film noise is thankfully retained showing off natural skin tones, including the glistening sweat pouring off of Stallone’s buff tree trunks, while black levels are generally stark. I didn’t notice any major or apparent flaws like artifacts, aliasing, scratches and the like. Colors do receive a slight boost due to the HDR, but it is ever so trivial. I did a quick comparison with the included Blu-ray disc and frankly the difference was negligible, with perhaps a minor edge to the UHD. Minor. The disc includes the DTS-HD Master Audio 5.1 track which I assume is the same as the one on the Blu-ray and even so, the audio does sound quite good with good lower levels for the clear dialogue coming via the center speaker and decent uppers in regards to some of the action scenes. As with the first movie, however, the LFE is on the weaker side so don’t expect a boost in an otherwise serviceable lossless track. Although Rambo: First Blood Part II didn’t have as much of an emotional core compared with the first movie and is certainly far more fantastical as well, yet it does have all the hallmarks of an entertaining over-the-top violence-laden action-fest that defined the 1980s and it was a delight. The 4K UHD release offers respectable, but still great, video and audio transfers and a solid selection of bonus features.